It’s hot. Time to cool down. How? By eating ice, of course. Shaved ice. 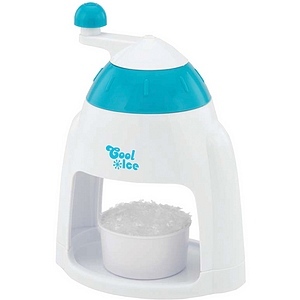 While just chewing ice cubes is certainly an option, the Back to Basics Manual Ice Shaver Model SIT10821 might offer a bit more flavor. It may be hot, and the heat may affect the brain, but shaved ice takes flavor on a bit more easily than just pouring syrup over a cube. Although, some day sugar-free, carb-free, no-calorie ice may become a fad diet. Either way, stay cool and get ahead of the trend with your own ice shaver.